I Forgot a Depressing Movie! 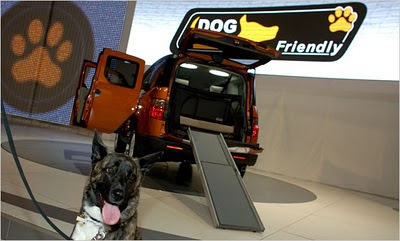 I'm not keen on the Honda Element's shape but since they came out with the pet friendly truck I really think it's such a great idea that I can look over the shape a little bit. Now while I have no plans to trade in my own truck anytime soon, I love these options and being a pet owner, I'd definitely choose something that had such great ways to help with the dogs, etc. The accessories are awesome! There's a package that includes a rear car kennel, leash, collar and dog tag, electric fan, kennel organizer, pet bed, a ramp you can stow, dog pattern seat covers (now that's thinking of everything! ), floor mats with a dog bone theme, a spill resistant water bowl, tote bag, and 3 dog friendly emblems! Now while they're not intended for dogs over 80lbs we're okay in that department and I'm sure if it's a huge hit as it should be, they'll eventually accommodate all sizes of dogs.